You can easily understand how much is important the religion for Corfiots, as for all the Greeks, looking the numbers of churches that are everywhere. Only in the old city there are about twenty churches. Hereinafter we illustrate only the most characteristic ones that you can visit having a beautiful walk in the heart of the city. Entering in the old city from the port side, before the Spianada and in the middle of the old buildings, there is the most famous religious monument of the island: the church of Saint Spyridonas. This church was constructed in 1590 and it is a typical example of ecclesiastical architecture of the Ionian islands in Greece. It has a single nave, a coffered ceiling bordered in gold with icons depicting scenes from the Saint’s life; it also has an impressive bell tower, the highest in the city, which can be seen even from the Liston. The outside is unpretentious but inside you can admire various paintings originally realized by P. Doxaras and, after their destruction, faithfully reproduced by N. Aspiotis. The church along the sides has two different entrances, one on Saint Spyridonas street and the other in front of a small square, in this way the pipe organ can be listened in all the roads around. In this church there is next to the altar a silver urn of the 19th Century with inside the relics of Saint Spyridonas who is considered the protecting saint of Corfu. Saint Spyridonas was born, lived and died in Cyprus where after the passing of his wife he devoted his life to the church and made numerous miracles. When Cyprus was invaded by Saracen his mortal remains were brought to Costantinopoli (when they opened his tomb they found his undamaged body emanating basil scent) and then when Costantinopoli fell against the Turks they were transferred to Corfu where they are even now. Spyridonas became the patron saint of the island because he protected Corfu two times from the plague in 1554 and in 1630, once from the famine and in 1716 he chased the Turks away. These four great miracles are commemorated with as many processions. 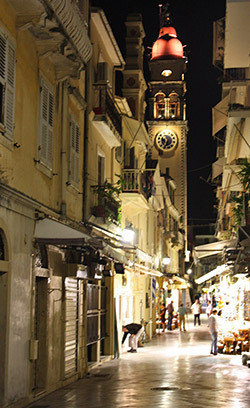 The official date of the celebration of Saint Spyridonas is on 12th of December, but exactly four times per year (11 August, first Sunday of November, Palm Sunday and Holy Saturday) his relics are carried around the streets of the city, in memory of the miraculous actions that saved Corfu and its inhabitants. If you are on the island in one of these dates go to the old town to see the procession and after to listen the most important musical bands of the island, so you will enjoy yourselves as anywhere there is a frisky atmosphere. 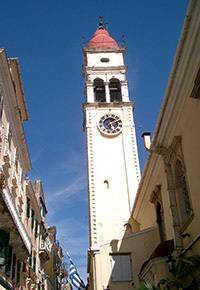 The church of Saint James is the catholic cathedral of Corfu. It's located next to the town hall, in one of the most beautiful squares of the old town: Dimarchio square. It was built in 16th Century, was destroyed during the second world war and rebuilt in 1970. It is an elegant church with three naves and a gothic tower. The church of Saint Spiliotissa is situated in front of the old port and it is named also Mitropolis after the public square in which it is. Rising over the square with its flight of steps, the church stands out for its bright color and the decoration that looks like a sun surrounding the rose window. The Spiliotissa name derives from "spilià" that means cave and it is the name of this area so called for the presence of a cave at the feet of the New Fortress. This orthodox basilica dates back to 1577 and houses the mortal remains of Saint Teodora of Augusta. She was a Byzantine empress canonized in the 9th Century and her relics arrived to Corfu from Costantinopoli together with the patron Saint Spiridonas ones. Inside the church there are Byzantine icons like the Madonna Dimosiana, painted on both sides, and others of the Ionic School made by Damaskino, Tzane and Paramithioti. 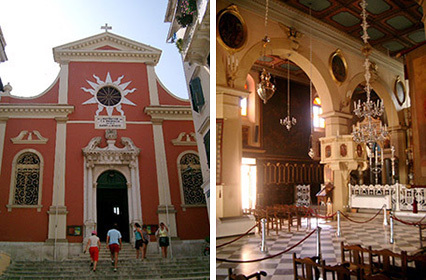 The Saint John Church is another example of the architectonic style of the Ionian islands. From Theotoki street it is possible to see only the lateral part of the church, where there is the entrance, and the typical bell tower that stands out between the buildings. The church inside presents one nave, a wooden roof and a perimeter corridor called "nartece" that contains interesting works to admire. The icons housed in this church were created by Tzane and Chrisolora while the vault belongs to Hope (1773). The Church of Our Lady of Strangers date back to XVIII century and it is situated in front of St. John Church. It is possible to admire also the pediment of this church that is very unpretentious and it differs from the previous for the bell tower and for the three naves instead of one. This church was constructed by the monk Nikodemo and it is considered the parish of the foreigners and particularly of the Epiro inhabitants. The vault was realized by N. Kutuzi while the wooden iconostasis constructed by Tzanes in 1875. This church was constructed at the beginning of XVI century and today is considered one of the richest of the old city. There are two different entrances: one in Dousmani street where there is a portrayal of Saint Nicholas next to the entry, while from the other entrance you accede to the aisle of the church passing through a courtyard full of trees. Inside there is a rare example of pulpit with access from nartece and a splendid iconostasis. The Church of Pantokratoras date back to the beginning of the XVI century and is situated in an area of the old city less tourist and calmer. The main feature of this church is the statue of an angel, carved by Torretti in the XVIII century, that is at the top of the facade.